The partnership between Mercedes-AMG and Cigarette Racing is legendary. Every time AMG comes up with a new supercar the boat makers release a special model celebrating that car. And so now it is time for a speedboat version of the AMG Project One, and it’s called Cigarette Racing 515 Project ONE. Right now we only have a teaser drawing of this magnificent thing to drool over, but the wait is not going to be long since Cigarette Racing 515 Project ONE will be revealed next week at the Miami Boat Show (February 15, 2018). Judging by what we can see, the boat tries to replicate the unique look of the hypercar with a special paint work featuring a silver base and black accents. As the sea-faring equivalent of the Project one, is also going to be fast. Like, really fast. And just like the car, it is going to be the privilege of a select few to enjoy its looks and performance. Just to recap, the Mercedes AMG Project One hypercar is the ultimate effort at making a Formula One car for the road. It literally uses F1 powertrain technology with a 1.6-litre V6 hybrid petrol engine with direct injection and electrically assisted single turbocharging that revs up to 11,000 rpm! The unit generates more than 1,000 hp and has a top speed beyond 350 km/h, which are the hypercar norms these days. There will also be two further 120 kW electric motors at the front axle, making the One four-wheel-drive. It remains to be seen if the boat is as much of a techno-feast as the car. 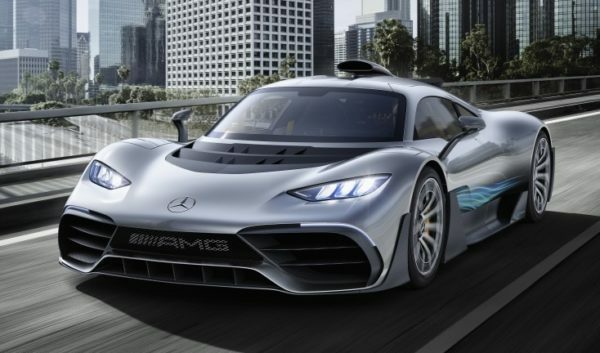 The post AMG Teases Cigarette Racing 515 Project ONE Speedboat appeared first on Motorward.